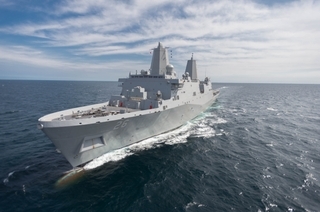 John P. Murtha (LPD 26) was delivered to the U.S. Navy during an afternoon ceremony at Ingalls Shipbuilding. PASCAGOULA, Miss., May 13, 2016 (GLOBE NEWSWIRE) -- Huntington Ingalls Industries (NYSE:HII) delivered the company’s 10th San Antonio-class amphibious transport dock, John P. Murtha (LPD 26), to the U.S. Navy today. The ship, built at HII’s Ingalls Shipbuilding division, was delivered during an afternoon ceremony with shipbuilders and ship’s force together in attendance. The signing of the DD 250 document officially transfers custody of the ship from HII to the U.S. Navy. LPD 26 is named in honor of the late John P. Murtha, who represented Pennsylvania’s 12th Congressional District from 1974 to 2010. In addition to his tenured history in the House of Representatives, Murtha was also a veteran of the U.S. Marine Corps Reserve. He served for 37 years and received the Bronze Star with Combat “V,” two Purple Hearts and the Vietnamese Cross of Gallantry for his service in the Vietnam War. He retired as a colonel in 1990. 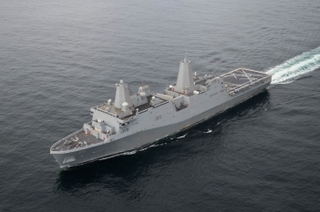 In addition to John P. Murtha, Ingalls has the 11th LPD, Portland (LPD 27), under construction. 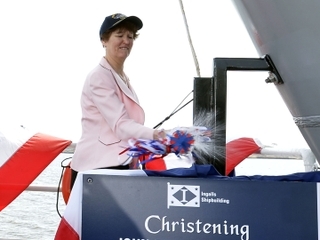 Portland launched on Feb. 13 and will be christened on May 21. 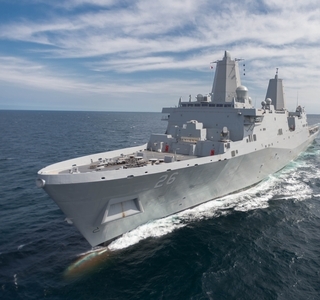 Ingalls has received more than $300 million in advance procurement funding for the 12th ship in the class, Fort Lauderdale (LPD 28). The San Antonio class is the latest addition to the Navy’s 21st century amphibious assault force. The 684-foot-long, 105-foot-wide ships are used to embark and land Marines, their equipment and supplies ashore via air cushion or conventional landing craft and amphibious assault vehicles, augmented by helicopters or vertical takeoff and landing aircraft such as the MV-22 Osprey. The ships support a Marine Air Ground Task Force across the spectrum of operations, conducting amphibious and expeditionary missions of sea control and power projection to humanitarian assistance and disaster relief missions throughout the first half of the 21st century.